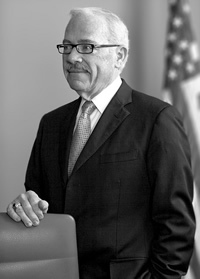 Bob Barr is the 2008 Libertarian nominee for President of the United States. Previously, he represented the 7th District of Georgia in the U. S. House of Representatives from 1995 to 2003, serving as a senior member of the Judiciary Committee, as Vice-Chairman of the Government Reform Committee, and as a member of the Committee on Financial Services. He now practices law with the Law Offices of Edwin Marger, and runs a consulting firm, Liberty Strategies LLC, headquartered in Atlanta, Georgia and with offices in the Washington, D.C. area. Barr works tirelessly to help preserve our fundamental right to privacy and our other civil liberties guaranteed in the Bill of Rights. From 2003 to 2008, he occupied the 21st Century Liberties Chair for Freedom and Privacy at the American Conservative Union. Since 1997 he has served as a Board Member of the National Rifle Association. Bob is also a member of The Constitution Project�s Initiative on Liberty and Security, and he served from 2003 to 2005 as a member of a project at the Kennedy School of Government at Harvard University addressing matters of privacy and security. In fact, recognizing Bob Barr�s leadership in privacy matters, New York Times columnist William Safire has called him �Mr. Privacy.� Barr serves as a board member for Privacy International, an international watchdog group headquartered in London. Bob has appeared on virtually every major cable and network television program dealing with public policy matters, and has served as a contributor for CNN. He has written a regular column for the Atlanta Journal-Constitution, hosted a nationally-syndicated weekly radio show, and served as Contributing Editor for The American Spectator. Bob�s writings appear in numerous academic, local, regional, national and international publications. He is the author of �The Meaning of Is, The Squandered Impeachment and Wasted Legacy of William Jefferson Clinton,� published by Stroud & Hall. He is a member of the Board of Advisors for the Georgetown Journal of Law and Public Policy. Bob has served as an adjunct professor at Kennesaw State University in Kennesaw, GA, and serves as a national officer for Tau Kappa Epsilon Fraternity. Bob was appointed by President Reagan to serve as the United States Attorney for the Northern District of Georgia (1986-90), and served as President of Southeastern Legal Foundation (1990-91). He was an official with the CIA from 1971-78. Barr is a speaker with the All American Speakers Bureau (www.allamericanspeakers.com). He has traveled widely and spoken to audiences across America and internationally, and has served as an official member of the U.S. delegation at several major United Nations conferences. Out of the users that have visited this site 253 out of 65123 say they would write in Bob Barr if they knew the write in would help get him elected for president. (Not every candidate is registered/eligible for write in votes in every state).